Chance The Rapper announced at Robeson High School Friday that the Chicago Bulls had donated $1 million to Chicago Public Schools, matching the Chatham native's recent donation. CHICAGO — Chance the Rapper made some major announcements Friday, expanding on his ongoing mission to help keep Chicago's budget-strapped public schools system — and its arts programs — afloat. Addressing students and the media at Paul Robeson High School, Chance announced the creation of the New Chance Arts and Literature Fund, which will partner with local organization Ingenuity Inc. to identify and donate to CPS schools "in desperate need of an arts program," the Grammy-winning rapper said. 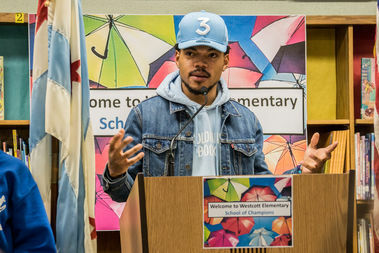 In addition to the launch of that program, Chance also announced plans to donate $10,000 each to 12 additional CPS schools, in support of his promise earlier this month to match $10,000 for every $100,000 donated to CPS outside of his organization. The additional $120,000 follows a $1 million donation from the Chicago Bulls, also announced Friday.